6 A: Who’s that? 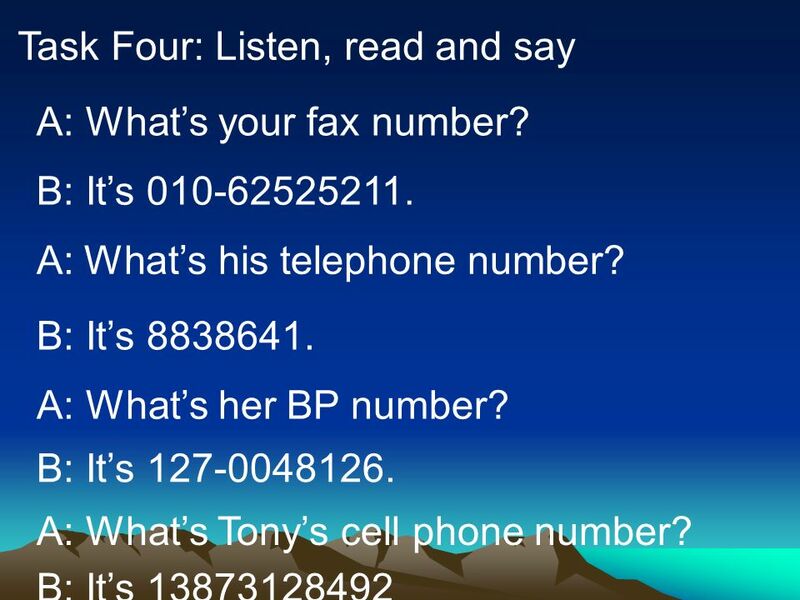 B: That’s Mary. A: How old is she? 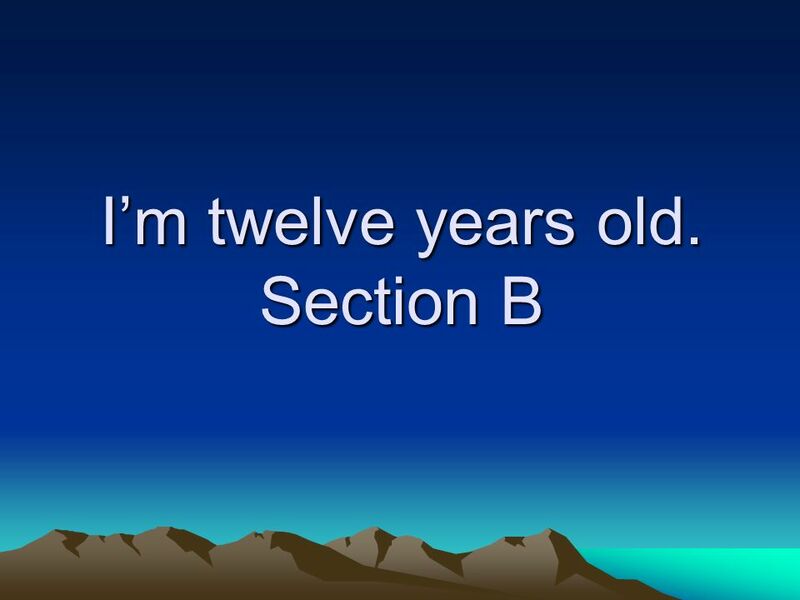 B: She is twelve. A: What class is she in? 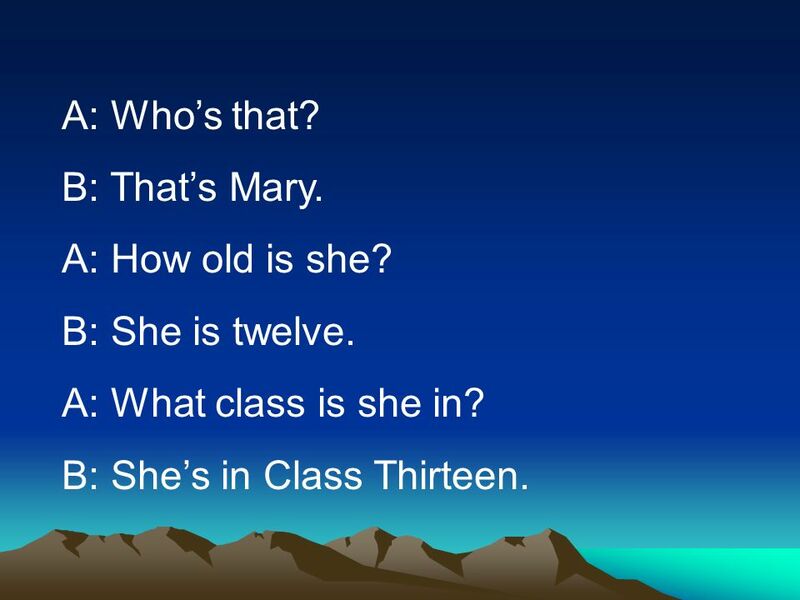 B: She’s in Class Thirteen. 8 Ⅳ.Task Three: Look listen and say. 13 Ⅴ. 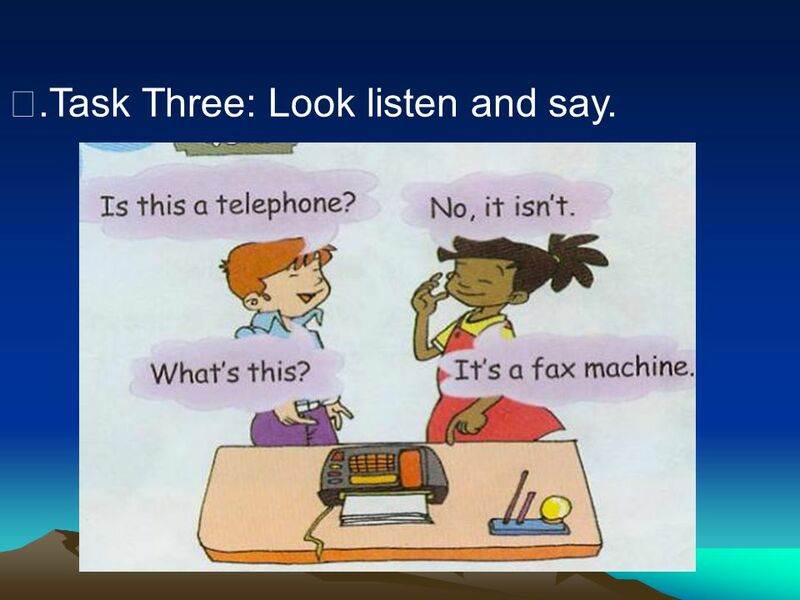 Task Four: look, listen and say. Who’s this? This is Kumiko. She is from Japan. She is a doctor. She is Japanese. 14 Who’s this? 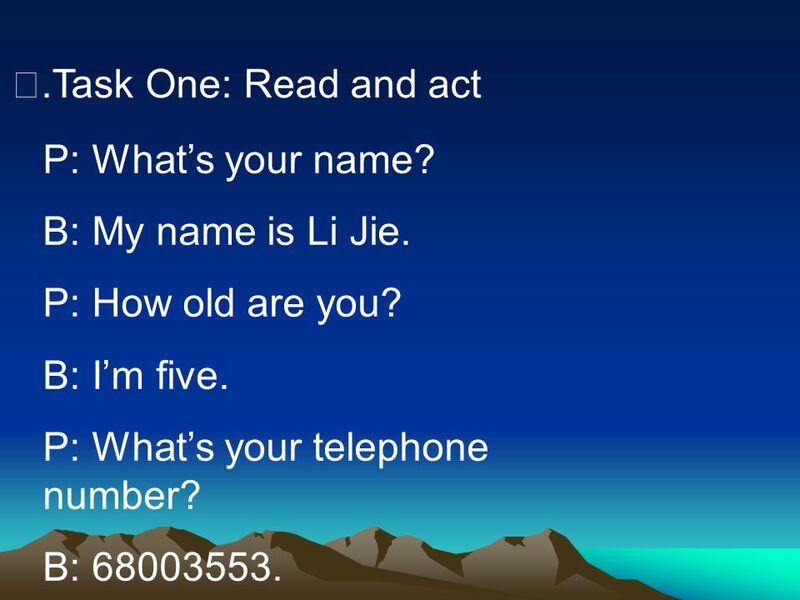 This is Wang Yu. 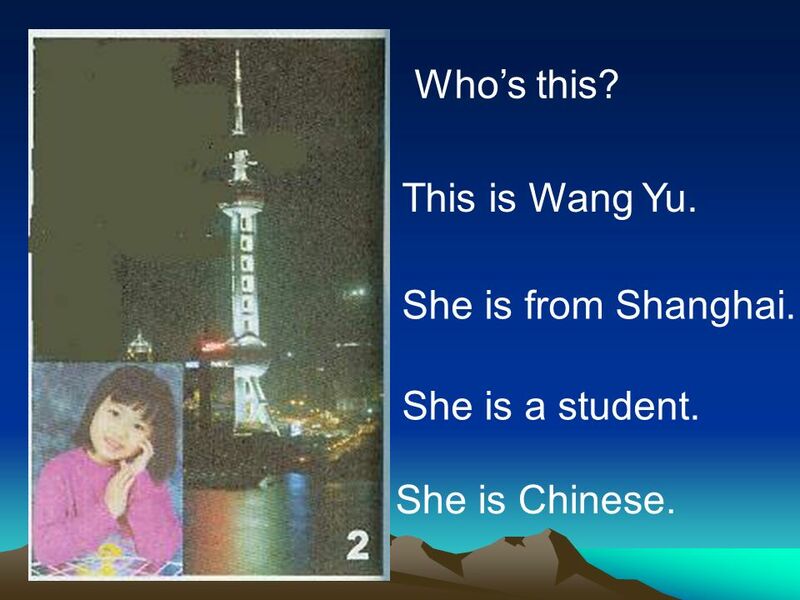 She is from Shanghai. She is a student. She is Chinese. 15 Who’s this ? This is Jack. He is from the United States. He is a teacher. 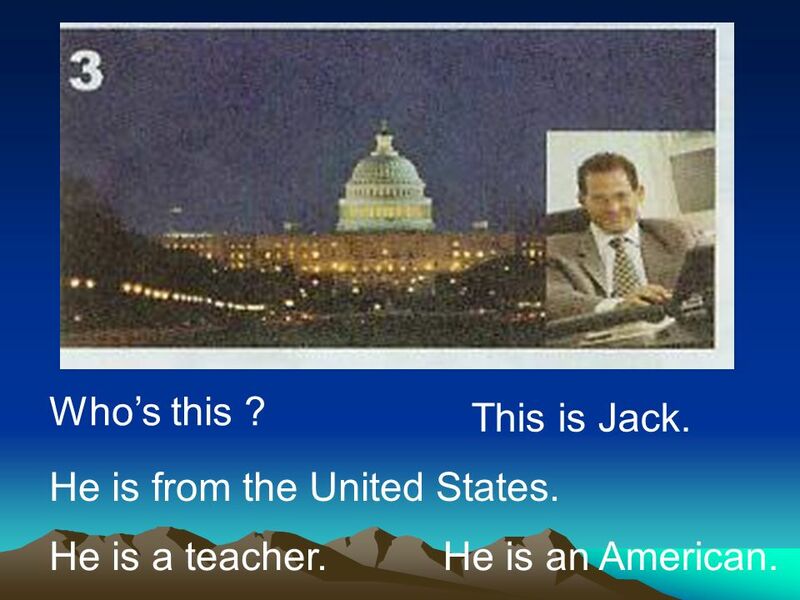 He is an American. 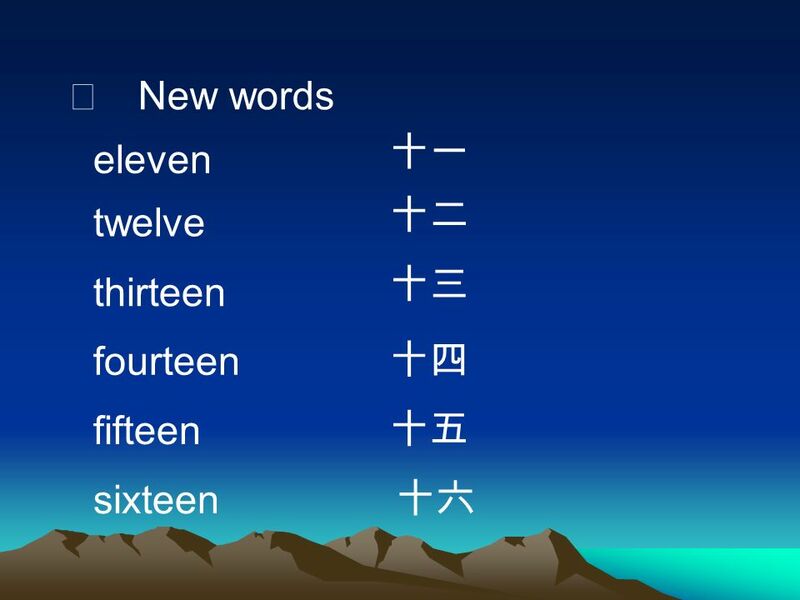 16 Ⅶ. 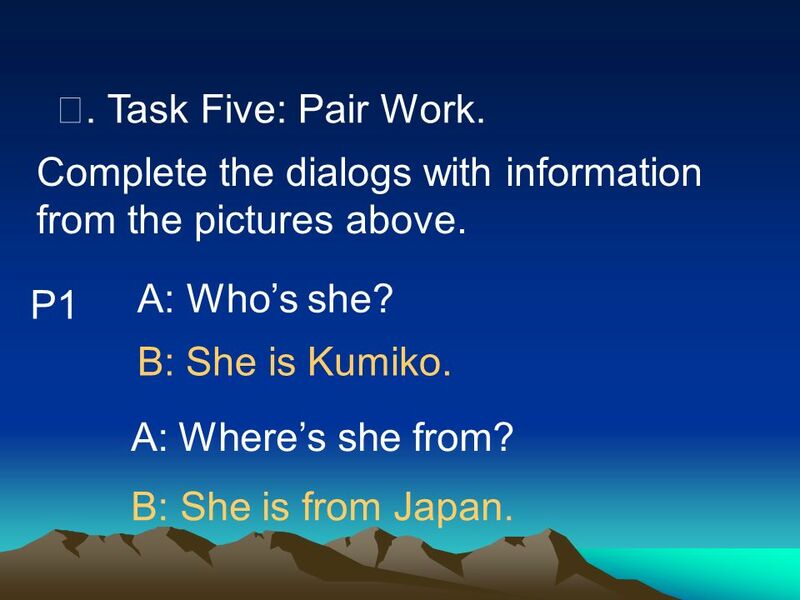 Task Five: Pair Work. Complete the dialogs with information from the pictures above. A: Who’s she? 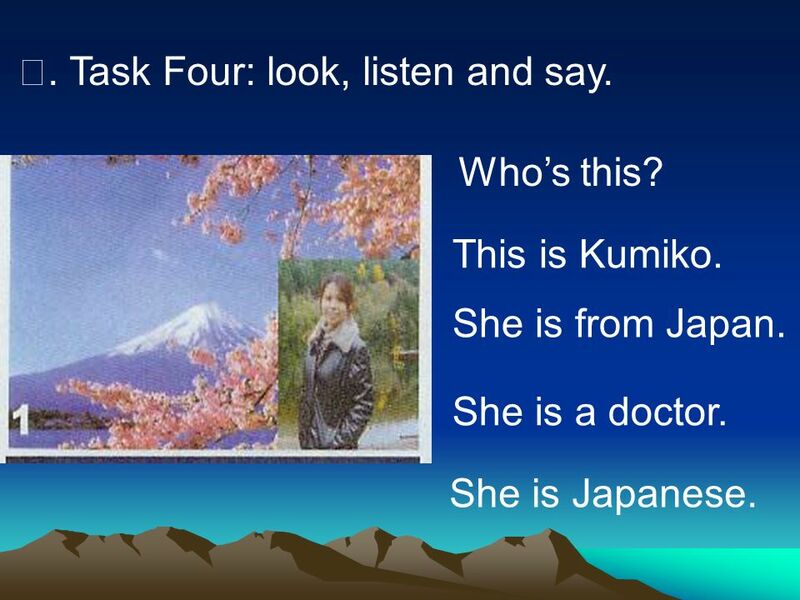 P1 B: She is Kumiko. A: Where’s she from? B: She is from Japan. 17 P2 A: Where’s she from? 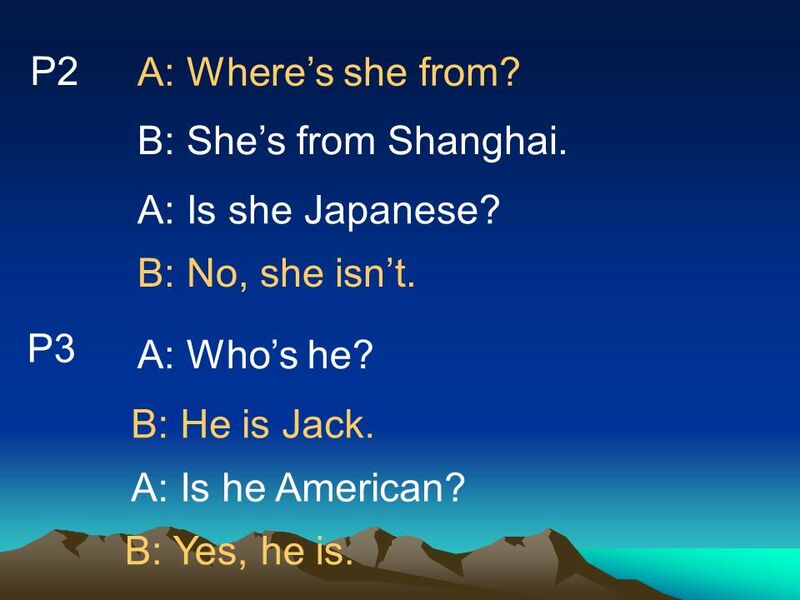 B: She’s from Shanghai. A: Is she Japanese? B: No, she isn’t. P3 A: Who’s he? B: He is Jack. A: Is he American? B: Yes, he is. 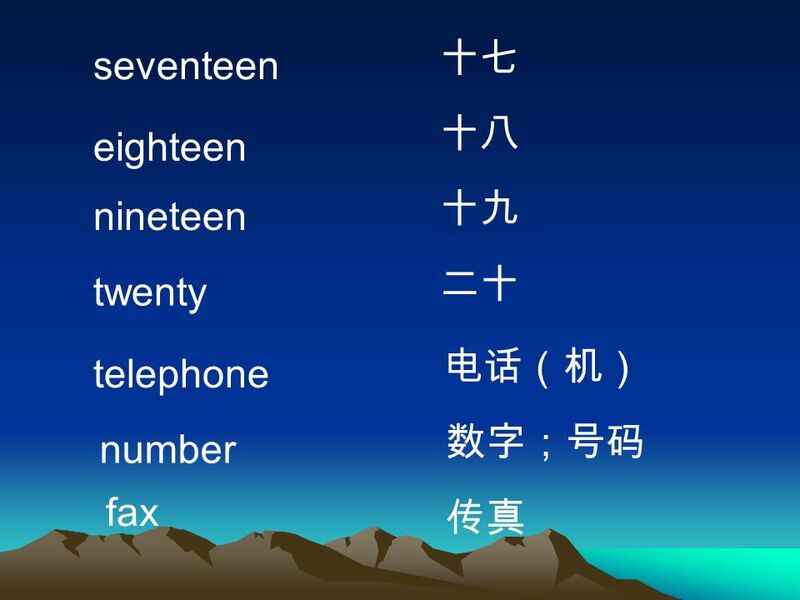 18 Ⅷ. Summary 1. Where’s she / he from? 2. Who’ he / she? Ⅸ. Home work 1. 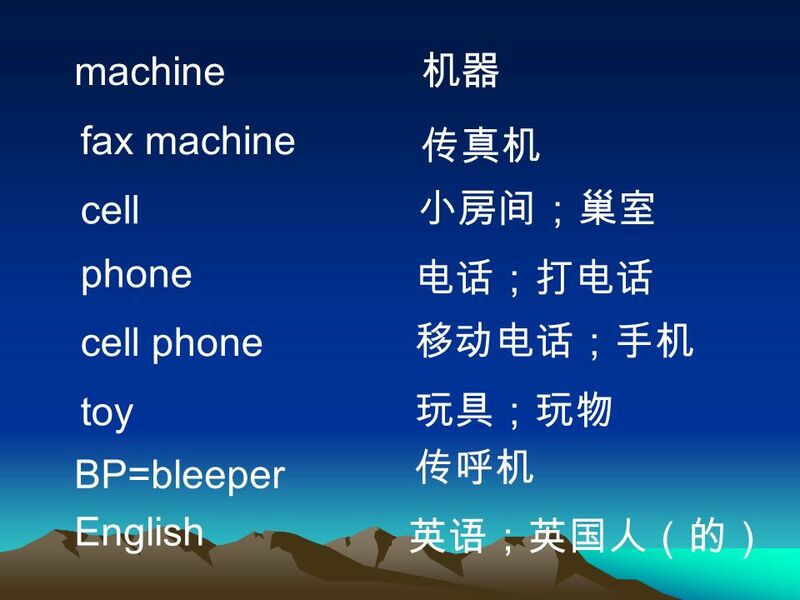 Recite the new words . 2. 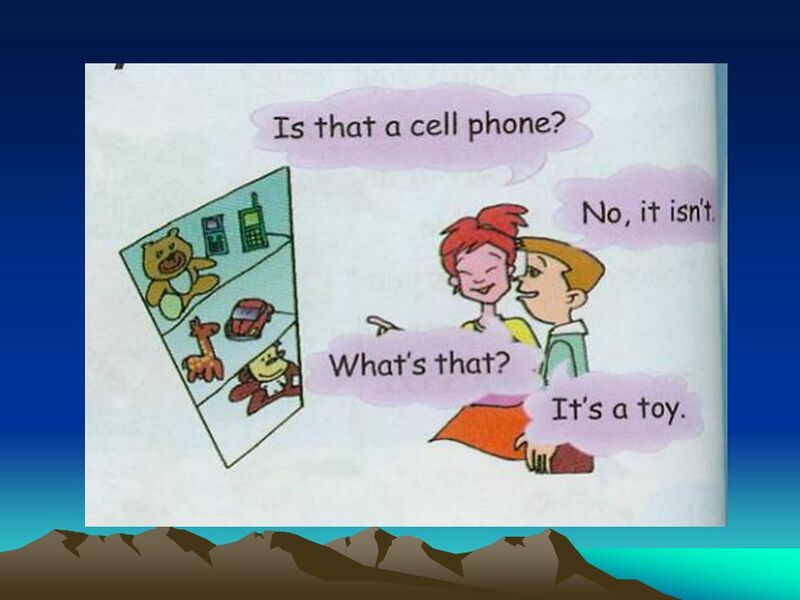 Exercise Book Section C.
Download ppt "I’m twelve years old. Section B"
Unit Eight When is your birthday?. IX. CONVERSATION PT 107 Lesson 6 Teacher: Juliana Lobo. Unit 4 He said I was hard-working. ( Section A ) Violet. 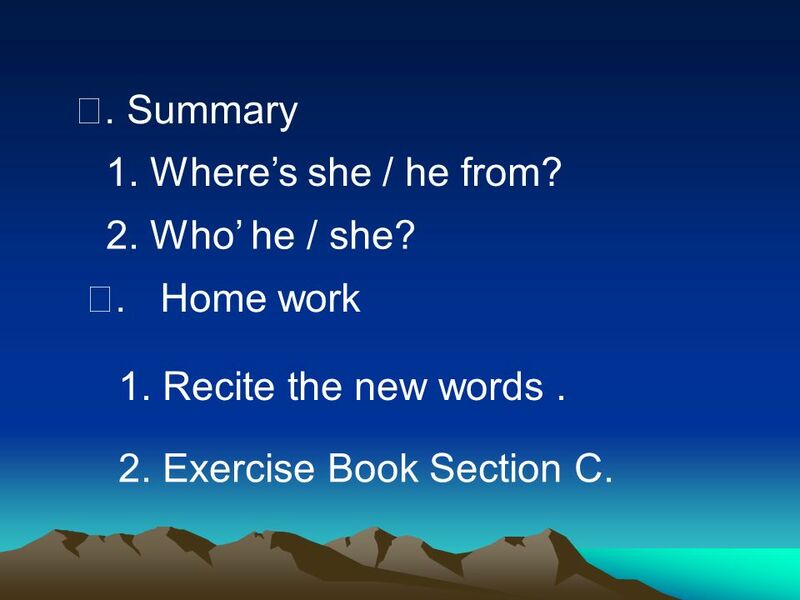 The first English lesson by He Wai From Dayun Middle School Module 1 Nice to meet you Unit 1. I’m from China and I’m Chinese. 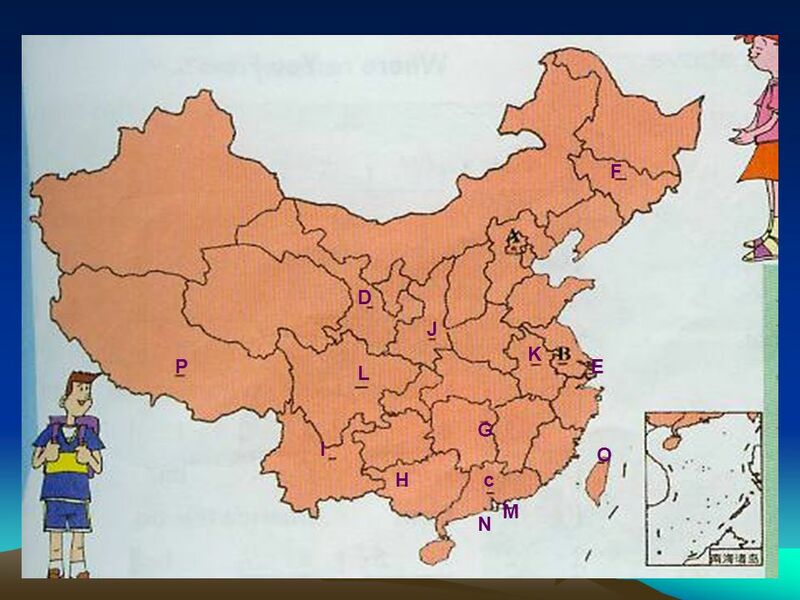 Unit 3 Language in use From Wang Junlan HongXi Middle School. NXT Wheel Spider Building Instructions MAXA ROBOTICS 2011. Mama Vulture. Vulture Eggs Eggs in there nest. Cant see her from this side. 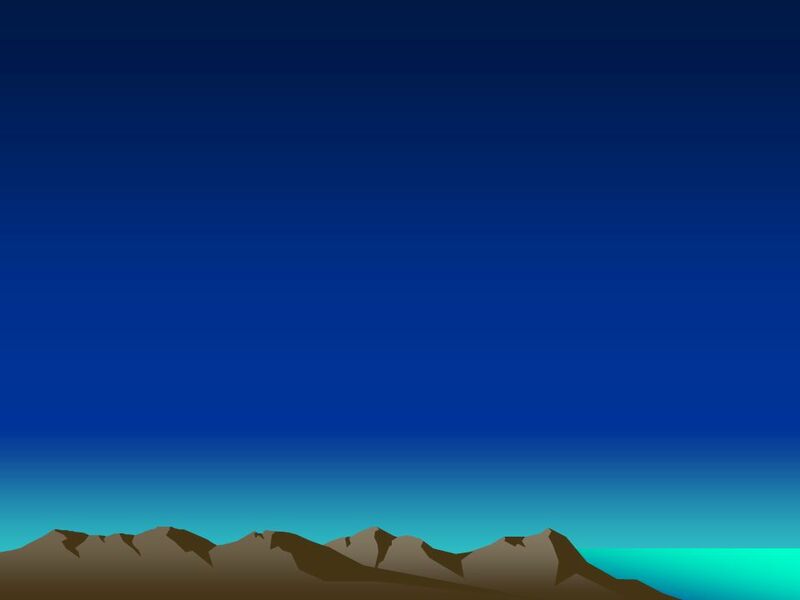 Task 1. Lena lives on the fourth floor. When she comes in, it takes her half a minute to get from one floor to the next. How long does it take her to. 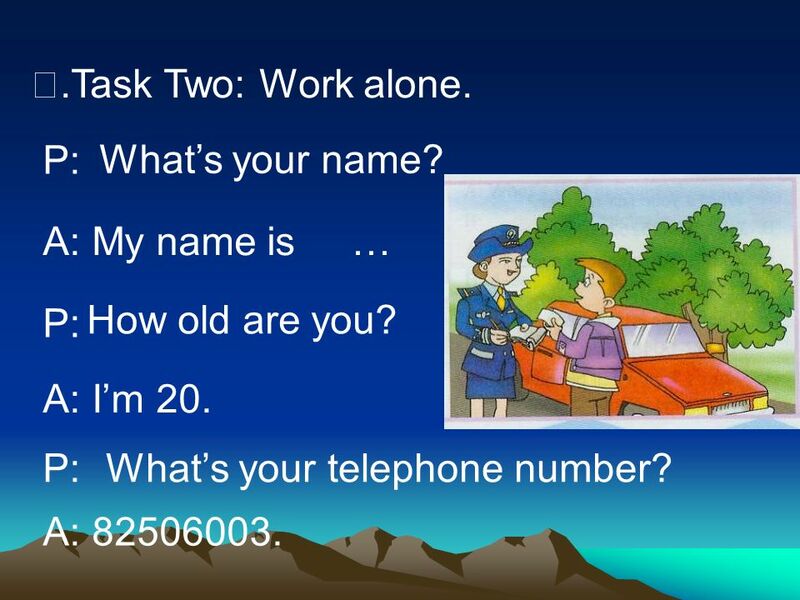 Unit 1: Lesson 4: C1,2/ P Vocabulary: one Numbers. Cardinal and ordinal numbers Salvador Orquín IES Escola Industrial Sabadell. The Little Monsters’ Song. How many monsters can you see? Sixteen Squared. 256 One Squared 1 Three Cubed. Multiplication Facts 9 through x 5= 50 Number One. We count one, two, three….